Good libraries provide more for their communities than just books to read. Here at the Granville County Library System we have programs available for everyone in the family. Check out some of our upcoming events and call or visit us if you have any questions! Storytime: Young children and their caregivers enjoy songs, stories, fingerplays, and crafts at the library. Join us at the Stovall Branch Library: Mondays at 10:30am, or at the South Branch Library: Tuesdays at 10:30am, or at the Thornton Library: Wednesdays at 10:30am. LEGO Club: Unleash your LEGO creativity! This bi-weekly drop-in program will allow children to create LEGO masterpieces that will be displayed at the library. Weekly themes can be explored to inspire inventiveness. Imagination is required! Join us at the South Branch Library: 2nd and 4th Mondays of each month at 3:30pm or at the Thornton Library: 2nd and 4th Tuesdays of each month at 3:30pm. STEAM (Science//Technology//Engineering//Art//Math): Each week elementary-age kids explore the curious world of science through hands-on experiments and learn innovative ideas for making our world a better place! Join us at the Thornton Library: Thursdays at 4:00pm. 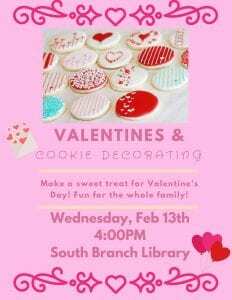 Make a sweet (and yummy) treat for your Valentine! Fun for the whole family! 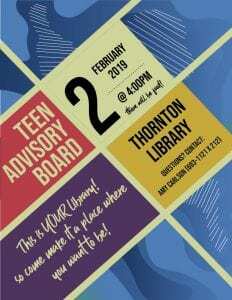 We want to give teens a voice in the library! Teens decide the programs they want at the library plus the books/DVDs that land on the shelves. Participating also counts toward community service hours for school. Join us at the Thornton Library on the first Saturday of each month at 4:00pm. Teen Time: Teens hang out with friends, have fun and relax! Play games, eat snacks and do whatever else teens like to do at the library. Join us at the South Branch Library on the third Tuesday of every month at 3:30pm. Teen Volunteering: Do you need community service hours for school? Want to boost your resume for college? Looking to help your community? Volunteer at the library! Simply ask for an application at the front desk of any library branch. 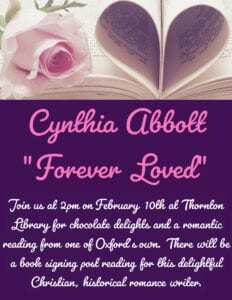 Join us for chocolate delights and a romantic reading followed by a book signing from this local, Christian, historical romance writer. Thornton Library: Sunday, February 10 at 2:00pm. Presented by Adlai “Pembo” Woodlief and hosted by the Granville County Genealogical Society. 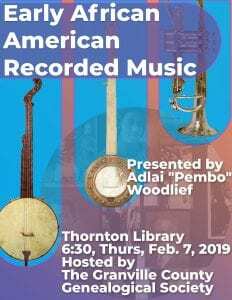 Thornton Library: Thursday, February 7 at 6:30pm. Buck Meeks’ song are for the lost dogs of honest mechanics, good guys and girls born into a life of crime, runaways, snow spirits, the ghosts of Central Park, unsung diving-board stars, the affection shared through gambling, and so on… Check out his music at www.buckmeekmusic.com. 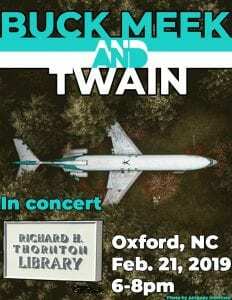 Thornton Library: Thursday, February 21 at 6:00pm.